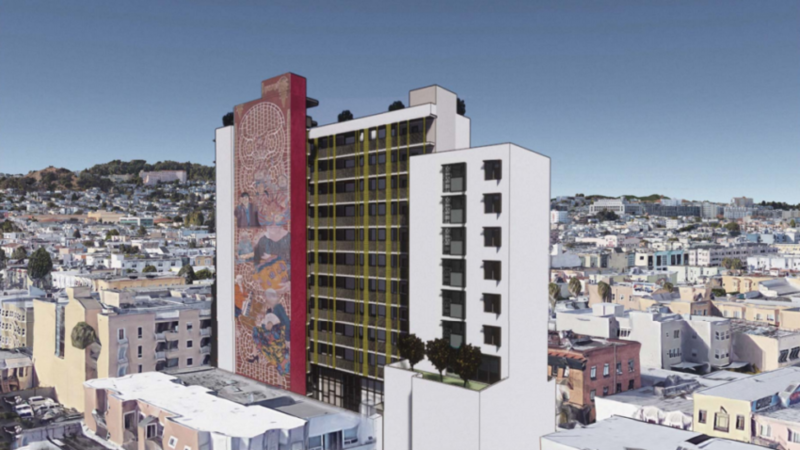 The new plans are a dramatic upgrade from MEDA’s original plans for an eight-story building that would contain 48 affordable condos, studio space for Dance Mission Theater, and classrooms for Mission Neighborhood Center’s early childhood education programs. The space reserved for the dance studio and the classrooms will expand in size as well. It would include no parking spaces. The nonprofit has not determined a total project cost — but it will exceed the $45 million it had projected for the last iteration. Feliciano Vera, a senior project manager at the MEDA, said the funding will come from another infusion of federal tax credits and a bigger construction loan to the tune of $41 million. The original loan was around $35 million, Vera said. MEDA purchased the historic building in December for $6 million and now must preserve the original “streamline moderne” facade, which the nonprofit estimates will cost at least $1 million. MEDA was allowed to build higher thanks to the state density bonus program, which permitted them to build 35 percent more density than ordinarily permitted by the city because of its inclusion of below-market-rate units. If the project receives its approvals, the nonprofit expects to break ground in February 2020, and would complete the project in 2022. The unit mix would accommodate a range of income levels: seven condos would be reserved for folks earning 80 percent of the area median income ($66,300 for one person); 14 condos for those earning 90 percent ($74,600 for a single person); 16 condos for those earning 105 percent ($87,050 for a single person); and 26 condos reserved for those making 120 percent ($99,500 for a single person). The condos would be kept affordable in perpetuity by capping the equity an owner can build through ownership of the condo — or having a potential buyer take out a “shared-equity mortgage,” defined broadly as a mortgage arrangement in which a homeowner shares equity with the lender following a sale. “I couldn’t afford one of those condos,” said one community member, upon hearing the news. Indeed, 42 of the units are reserved for those earning more than 100 percent of the area’s median income: $82,900 for one person. Other community members at meeting focused on two concerns: the project’s height and lack of parking spaces. Vera responded that the extra height simply allows for the inclusion of more units for low- and middle-income homeowners. Another community member asked how MEDA plans to accommodate 68 new potential residents — some of whom are all but certain to have cars. Vera said the project would be situated in a transit-rich location, with two BART stations on either side of Mission and several bus lines that run directly in front of the building. He also said building below-ground parking is “prohibitively expensive” — as much as $1 million per floor of underground parking. “Every dollar that we would use to pay for parking is a dollar we can’t put towards affordable housing,” he said. At present, MEDA has 557 affordable units in the pipeline, spanning five projects. According to the nonprofit, a total of 856 units are slated to built in the neighborhood, and all of them should be completed by 2022. Moreover, MEDA currently controls 617 units, either through its small-site-acquisition program or its public-housing program. The nonprofit is also closing in on a purchase of the historic Redstone building at 16th and Capp — estimated to be on the market for upwards of $25 million. North and West perspective of the proposed project. Photo courtesy of Gelfand Partners. 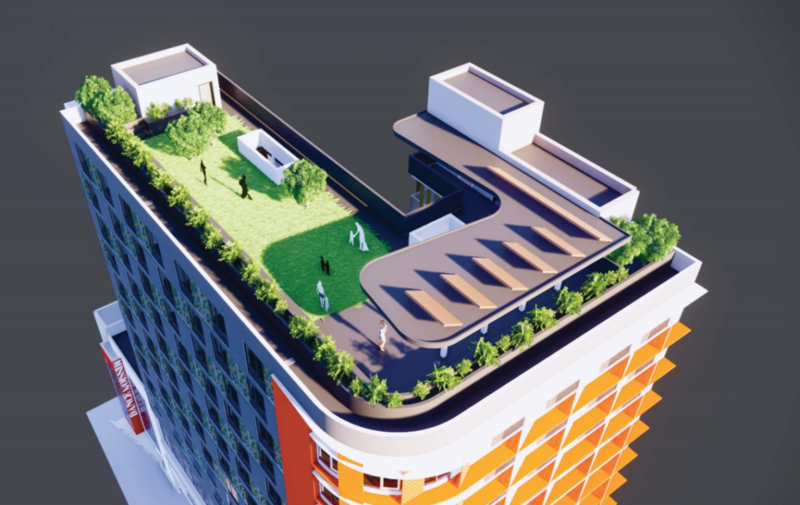 The proposed project would include a roof deck community garden. Photo courtesy of Gelfand Partners. 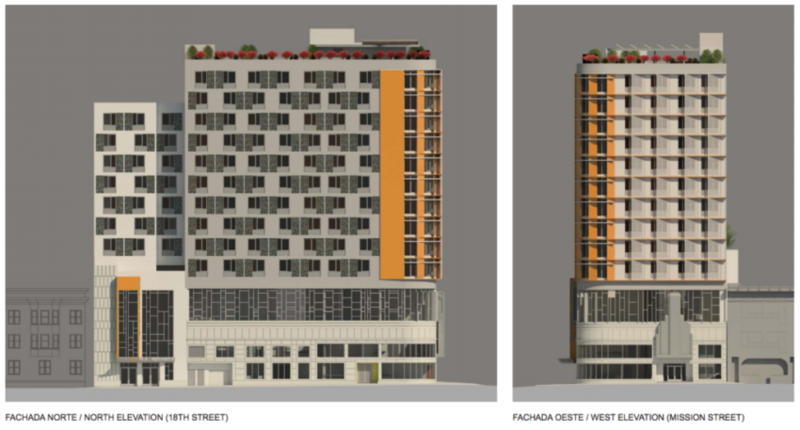 2205 Mission Street, new designs for the 12-story condo tower. Courtesy of MEDA. Holy Crap! A 12-story building at the corner of 18th and Mission Streets! This is completely unacceptable! The building height in the Mission is 50 feet and the community spent years agreeing on this height limit which works. At five stories you’ve got enough ‘air’ space to provide housing and services needed by residents and the neighborhood. Just look at the building across the street with Duc Loi Supermarket and Linea Caffe at street level. The building that houses market and cafe was once a one-story building with a parking lot. The owners built a modern building that includes both housing and two storefronts. The building is at the maximum height limit for the area. It utilizes the space well and isn’t an eyesore to the surrounding buildings and residents. It doesn’t block views or the sun and isn’t an eyesore to anybody living, working or just visiting the neighborhood. MEDA’s proposal is absurd and unacceptable and is out of character for the area. The first proposal of an eight-story building was bad, but this revised version is a ‘nightmare’ for everyone. MEDA and it’s leadership should be ashamed of themselves – completely ashamed. I for one will not be supporting this proposal as it is a grotesque abuse of MEDA’s position in the community and an affront to the residents of Mission. Allowing this building to be built according to these plans (or the eight-story plan) will exasperate the gentrification of the neighborhood and degrease cultural distinctiveness of the area. NOT because this building will exasperate gentrification as the units are supposed to be below-market rate but because other developments will see what has happen at this corner and will try to exceed the normal height limit on other projects. This project needs to be rejected, scrapped and take back to the drawing board. If this project is allowed to move forward the character of the Mission will be changed for the worse. It’s a handsome high-rise (the most expensive kind of building to construct), but we must protest against it since it might cast a shadow on somebody and, though it is 100% taxpayer subsidized, the purchase price for it’s so-called “affordable” condo units is still too high for the complainers. And once it’s built, the new taxpayer subsidized owners will complain about this defect or that defect and, via their newly formed HOA, sue the so-called “non-profit” developer MEDA, for their faulty work. That’s going to cast some serious shadows on the neighborhood. Im glad the extortionists at MEDA are building dense, but why not at the historic laundromat? Oh, that’s right, 25% shadow. Hypocrites! Can MEDA please explain how this is affordable to the families they serve? The majority of the units will be priced at 120% AMI, that’s for a family of four making up to $142,100. I have attended community meetings were groups like united to save the mission repeatedly state that the average family in the Mission makes significantly less. If they truly want these units to go to the Latino families in the Mission they cant be priced this high. While the units can be called affordable they are not affordable to those they claim to help. It’s because MEDA’s greed is causing the construction costs — and, therefore, the costs of the units — to be so high; doncha know! MEDA’s just another greedy, home-creating, shadow-casting developer! Are these publicly subsidized units really only supposed to go needy *Latino* families, or are other races of needy families supposed to be assisted also? Too high and too much for the neighborhood. Fighting forced density and then taking advantage of those laws makes no sense. 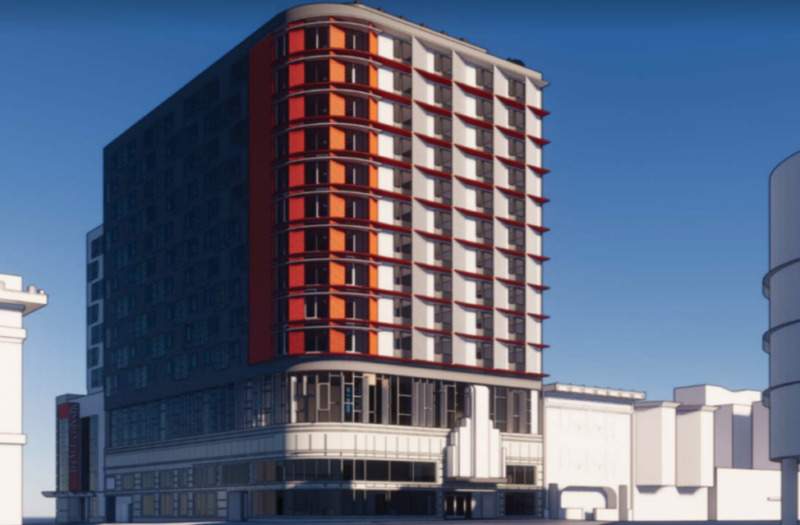 The height of the proposed building is perfectly fine for the neighborhood; however, it’s blatant hypocrisy of this so-called “non-profit” developer, and it’s supporters, that’s offensive. The height of this building really projects wealth and privilege up and down Mission Street’s family corridor. Remember the movie Dancing With Wolves? Specifically the scene with Costner and the wise, old Native American elder in the tent discussing the encroachment of settlers into the ancestoral lands? The elder pulls out of a sack the helmet of the Spanish conquistador and intimates that the tribe has had invaders before and repelled them. Costner replies something to the effect that this time is different, that these new invaders are here to stay. A classic scene with an invaluable lesson for today. If anyone thinks that developers to come will be stopped by height limits or density limits or shadows they are sadly mistaken. There’s just too much money at stake and too much tax revenue to be gained for the city’s coffers. As the saying goes, you may be able to slow it but you’ll never, ever stop it. Sounds like MEDA knows the writing is on the wall. Those quaint, little cottages along San Carlos and Lexington will never come down but rest assured it is only a matter of time before ten, fifteen stories and more begin happening. And yes, the big money at City Hall has put the Mission on the spit – thanks to BART. If your family sold in the Mission in the last ten or fifteen years or god forbid less than five years ago you will live with that sword over your head for the rest of your life. Did readers catch that part about shared equity in this planned MEDA development, a.k.a. there’s no free lunch? That’s means if ever sold…well, I assume you get the idea. Quite a few years ago I used to have Stanford professors and retired professors as clients in Palo Alto. As a professor you were granted housing, and pretty nice housing at that. And your spouse could stay after your demise. Well, from what I’ve heard Stanford has reversed course on the spouses. See ya! Things change. I remember ten years ago telling coworkers living the life – many in the Marina or Russian Hill that they had better get over to downtown Oakland and buy ’em up – especially after the downturn when prices were halved. Well, that didn’t go over well for a number of reasons but bottom line now is they only wish, as in wish they had. Research Zillow on selling priced five, ten, fifteen years ago. The one and only way San Francisco will ever get anywhere near viable first-time homes for the masses is to build, build, and build some more. But – sorry to say the slimey, capitalist pig developers will have to make a buck, maybe even an outsized buck. And god forbid you have a sacred slice of sunlight. Build that Geary corredor – all the way out to the beach. Heck, build along the beach. Those people with their views or whatever? They’ll be dead eventually so why is their view sacred? Build out that Third St corredor as well. Too bad for those people perched up on Potrero or Bernal or Diamond Heights – seriously. This City will get you eventually. More and more so every day. I have two good friends with thirty years here planning on going back home to the east coast. If I told you what they each bought homes for you wouldn’t believe me so I won’t. So, if you have problems with shadows now stick around for a few years. If you see the need for more housing better ask who your real friends are. So much for community development from MEDA, this is an outrage and clearly not designed for the longtime Mission residents, with that income requirement. and the height and no parking spaces? More density, shadows and crowdedness, burden on the infrastructure, but they take advantage of federal funding to hurt the Mission community even more. MEDA is developing 2205 Mission in response to the needs of our teachers and cultural workers who are struggling to stay in San Francisco. As we built up our pipeline of over 1,000 homes to keep families and seniors in and around the Mission District, we recognized we were losing those who had dedicated their lives to support our families. At the same time, when 2205 Mission came up as an opportunity, it was priced for 100% luxury housing and would have been yet another development changing the neighborhood fabric. To secure this corner of Mission Street, we purchased 2205 Mission to make it 100% affordable housing for households to own homes in the Mission and be more deeply rooted as the neighborhood changes. And to keep Dance Mission and Mission Neighborhood Centers serving children, youth and adults in educational and arts programming. Those windows!!.. they are too big. They exude class and privilege. Please make them smaller. So only rich people should have access to decent amounts of daylight with well-sized windows?? Come on, now, that’s ridiculous! This building is going to be 100% affordable housing, according to MEDA. Would you be happier if it looked like a projects, so that everyone would be clear about the fact that the people who live here aren’t rich??? That’s ridiculous! Sally is sarcastically referring to MEDA’s objections to a previous project that had larger windows. It was MEDA who objected to the large windows, saying large windows were a gentrifying factor because large windows are for luxury housing. Are you saying that Techers and Cultural workers have priority over eveyone else for these affordable units? Please expand on this statement you made. MEDA, you are way off base with this proposed project. The immediate neighbors are not okay with the proposed height, which is MUCH taller than any other building anywhere nearby, will cause buildings in front of it to get no direct sunlight, will bring 100’s of new residents to one corner all of a sudden with no assigned parking, which would be a huge burden on this neighborhood, both for current residents who park, but also for MUNI infrastructure, which is already horribly overcrowded, and won’t activate that dead, decrepit corner until 2022 at the earliest. When those of us who attended this meeting brought up our concerns, we were drowned out by MEDA folks who basically told us we have to say yes to this project because the city needs more housing. While it’s true that the city needs more housing, you don’t have to build all of it in one over-height building that looks like a giant middle finger to the rest of the Mission! Have you thought at all about how you’ll be negatively impacting the immediate neighbors? Do you even care? You should, and you should know that at least three HOA’s directly around this proposed building are organizing and prepared to fight your plan based on your proposed height. So the question becomes, do you want this site to become like the laundromat down the street, or are you willing to work towards a compromise with neighbors? I believe many of the neighbors on Lexington, San Carlos, & Capp would like to support the current (3) HOA’s who are opposed to it. Our HOA will certainly join you. I’m working on another affordable housing project using SB-35 and we are not creating an eyesore such as the massing proposed. Aside from a terrible design job, the height/stories proposed is not appropriate for the neighborhood of predominantly 1-2-3-4 story buildings. I support Wieners law to ease affordable housing production but I don’t think this was what he intended. I don’t know anything about you MEDA, other than that, to me, you’re trying to alleviate the housing crisis in SF by, god forbid, attempting to build more housing in San Francisco. Props to you. A lot of the comments chastising MEDA are, in actuality, in support of maximizing the development potential of transit-rich urban sites such as this one, but are offended by MEDA’s obvious hypocrisy in fighting against even more modest proposals elsewhere in the neighborhood (like 2918 Mission) because they claim other developments are supposedly “too tall” and will cast “too much shadow”. While it is not stated, I surmise that these units will cost abt $800,000 each (63U / ~$50M). How I luv “affordable housing” in the morning. This is ‘middle class’ housing; its just not the same Middle class I was in a short while ago. This is a great step forward! We need as much housing as we can get. Shadows are a small price to pay for housing for real human people. Hopefully those opposed to the height can learn some empathy for those less fortunate and get behind building enough housing for everyone, so that SF can be an affordable city for all. Also, MEDA is ridiculously hypocritical but we all know that. Does any one know when the next city or community hearing will be regarding this building? Thanks. Sounds like this is the new “MEDA Monster in the Mission”.